Many people are familiar with the famous “We Can Do It” poster. The female worker, nicknamed Rosie the Riveter, from WWII with her hair wrapped in a red bandana, muscle boldly flexed, proudly stating that “We Can Do It!” in response to women helping aid in the war effort. But what many people may not know is that Rosie the Riveter is a fictional character that celebrated the women who went to work in factories and shipyards during the Second World War. During the war women entered the workforce in groundbreaking numbers, helping fill positions that were left empty by enlisted men. For many of these women they were unsung heroes whose stories over time are slowly being lost. 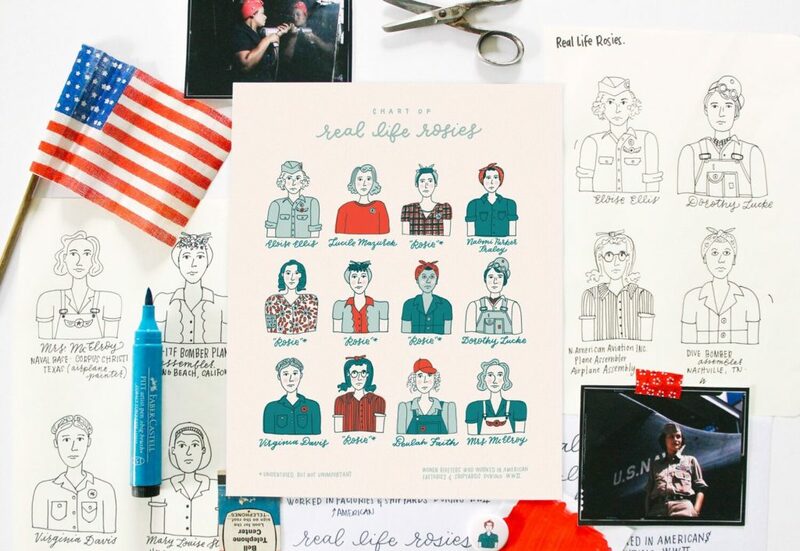 My hope with my Chart of Real Life Rosies art print is to preserve the legacy of some of these women who boldly contributed to America’s war effort in any way they could.